It’s a great video. I remember when the Foo Fighters formed from the ashes of Nirvana in the mid-1990s, and people complained about them because they didn’t sound like Nirvana. But then again, if they had sounded like Nirvana, people would have complained about that, too. I like their music but if you don’t, there’s probably nothing I can do or say to convince you otherwise. I also like their videos. There are so many rock bands that take themselves too seriously and don’t really worry about making entertaining music videos anymore. And I guess that’s fine, since with bands it’s supposed to be about the music, not the video. But a cool video can really enhance a good song, and the Foo Fighters have had a long run of videos that are lighthearted, funny, and entertaining. Has anyone out there tried this? Did it work for you? I’d be keen to try it myself, but I don’t think they sell Mentos here. Also, I’m assuming Coke Light (what they have here) is the same as Diet Coke, but then again, there may be some difference. Oh well. Enjoy some Foo Fighters! Thanks for reading. Stay safe out there! 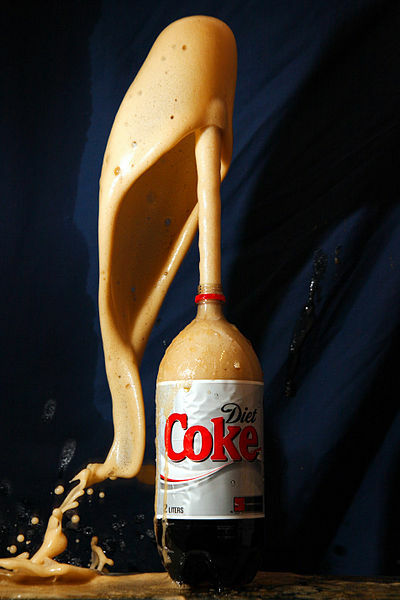 This entry was posted in Big Me, Diet Coke, Explosion, Fighters, Foo, Foo Fighters, Fun, Funny, Mentos, Music, Science, Video by Sitzman. Bookmark the permalink.